Be the first to share your favorite memory, photo or story of Diana . This memorial page is dedicated for family, friends and future generations to celebrate the life of their loved one. 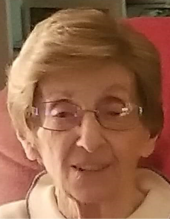 age 98, of West Mifflin, formerly of Duquesne, passed away peacefully surrounded by her loving family, on February 1, 2019. Diana, beloved mother, is survived by son Lloyd Walkauskas, daughters Claire Brede and Jeanne Godine, 8 grandchildren, 12 great-grandchildren, as well as many nieces, nephews, and friends. She was preceded in death by her beloved husband of 57 years Peter Walkauskas, parents Peter and Dorothy (Markovich) Novich, and daughter Lynn Hodgson. She was a friend, counselor and loving mother whose enduring faith in God was the foundation of her life. Visitation will be held on Wednesday February 6, 2019 from 2-4 pm & 7-9 pm at the JEFFERSON MEMORIAL FUNERAL HOME, INC., 301 Curry Hollow Rd., Pleasant Hills, 15236. A Blessing Service will be held Thursday February 7 at 10 am in the Chapel at the funeral home. Memorial contributions may be made to Christ Light of the World, 32 S 1st St, Duquesne, PA 15110. Condolences may be left at www.jeffersonmemorial.biz. To send flowers or a remembrance gift to the family of Diana Walkauskas, please visit our Tribute Store. "Email Address" would like to share the life celebration of Diana Walkauskas. Click on the "link" to go to share a favorite memory or leave a condolence message for the family.